The romantic, seductive island of Santorini never gets old (figuratively speaking, of course). 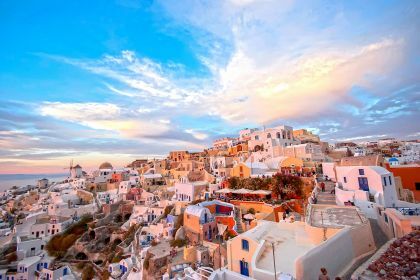 The exclusive village of Oia, where whitewashed villas overlook the caldera, is the prime spot to gape at those famous Santorini sunsets. Your perfect Cycladic itinerary could also include dazzling Amorgos and the remote island of Astypalea.. 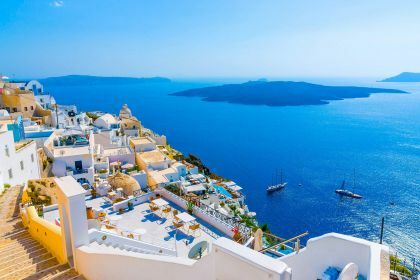 Call or contact your friendly Abberley charter broker here for assistance in planning an unforgettable yachting vacation in Santorini and the Cyclades. Greece boasts an impressive 6000 islands, meaning there is unlimited fun and adventure for both seasoned and rookie yachtsmen. What’s not to like? There’s endless sunshine, magnificent mountains, breathtaking views, historical sites, excellent shopping, cosy harbours, celebrity-spotting in the luxury yachts berthed next to you, topped off by heavenly food and wine. Santorini, the star of the Cycladic islands, in the middle of the Aegean Sea, stands out like a dazzling jewel. Many locals and tourists regard the “honeymoon capital” as the most spectacular of all the Greek Islands. Indeed, it was recently voted as one of the most beautiful islands in the world. Include Santorini in your sailing or motorboat itinerary and marvel at the heart-stopping beauty created by the volcano that is believed to have ended the Minoan Civilisation. There are still signs of erosion and volcanic activities all over the island. Some of the signature Santorini white and blue houses are built right on the edge of the volcano. The black sand beach is exotic and beautifully bizarre. Lounge on the deck of your yacht and admire the dark landscape without being burned by the sand that can quickly heat up in the summer heat. Not all of Santorini’s beaches are black though. The Red Beach is particularly astonishing, with the striking contrast between the cerulean-blue water and red sand. Start your exploration in the capital Fira, 300m above the port. You can access it by cable car, riding a donkey or climbing the 300 zigzagging steps. 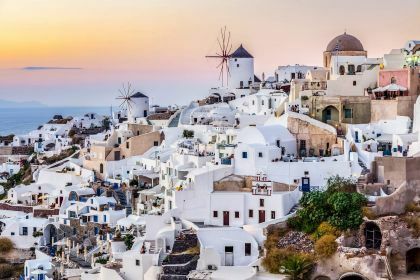 You will be rewarded, however, by the mixture of Venetian architecture (it was inhabited by Venetians in the 18th century) and Cycladic (an early Bronze Age culture) traditions —the perfect backdrop for adventure and romance. Take a walk along Fira’s white cobblestone streets, hunt for souvenirs, buy mementos or just watch the world go by in a stylish cafe. And if you’re missing the adrenalin rush, you’ll be impressed by the choice of water-sports available: parasailing, jet skiing, water skiing, wakeboarding, canoeing, diving, and more. Perivolos and Perisa Beach are two of the best locations for water sports. While on Santorini, don’t miss the lovely panorama of the picturesque settlement of Oia or la. The whitewashed buildings and blue domes of this pretty yachting town are included on the Unesco Heritage List. Admire the caldera (large cauldron-like volcanic depressions), and the volcano and stroll through the streets. In the late afternoons, don’t miss the unforgettable sunset over the bay. Let us give you the time of your life in picture-perfect Santorini and the Cyclades Islands. Our friendly Abberley yacht charter brokers are happy to answer any questions you might have. 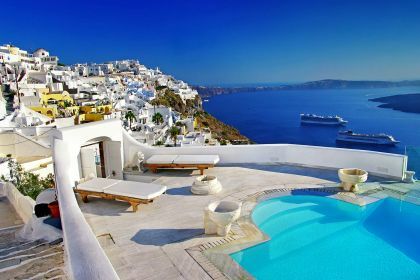 Drop us a line here or give us a call and we will make sure you have the luxury vacation in Santorini you deserve.